“As a Christian there is stuff I know we should be doing, and really want to be doing, but in our lives right now there just isn’t enough time.” Does that sound like something you have said? If you haven’t said it, is it at least how you have felt, yet you never dared speak those words out loud for fear that doing so would somehow force you to deal with the reality of what your own ears heard your mouth say? In a recent conversation a friend relayed just those words to me. They had been speaking to someone who has a longing, a deep yearning, to do something more, something significant for the kingdom of God. They even have a sense of what that would be. But they just don’t have the time. Now we are not talking about starting a ministry that will end world hunger in forty days, or bring the Gospel to every person on the planet in their own language by next year. We are talking about things like, “I need to be in community with other followers of Christ in a way that we really do life together”. It is about the yearning “To live in such a way that I know my neighbors better and am serving them as Jesus serves”. It’s about “having a more devoted time of prayer and reading God’s Word so that it shapes me into who Jesus wants me to be”. It is about stuff that every follower of Christ can and should do, but so often says, “I just don’t have time”. Something is seriously wrong. Think about this for a moment. There is stuff you know you should be doing and even want to be doing, but there is just not enough time. WOW! How is that possible? How can you not have time to do something you know God wants you to do and you have a desire to do? Is God playing some kind of cosmic joke on you? He gives you a desire and longing to do something and then makes the days too short for it to be possible? He gives you a desire and a command to spend more time with your children but at the end of the day He arranges your priorities so it is impossible. As a result you are left feeling frustrated, disappointed, and guilty. All because you haven’t done what you are sure God wants you to do? All the while, deep in the recesses of your soul is this feeling that God is just not being fair. He asks something of you then seems to make it impossible to accomplish. It sounds like an episode out of the Twilight Zone, where some unseen entity is running experiments on a person to see how long it takes for them to go nuts when faced with a crucial task that just can’t be completed, no matter how hard they try. What makes this especially surreal is the explosion of modern time-saving devices. Devices that were supposed to free us up for all kinds of noble pursuits have completely failed. It took my grandmother a couple of hours everyday just to make dinner. Now we can pop it in the microwave or order take out and save hundreds of hours a year. It used to take the better part of an afternoon to cut and rake the yard with a rotary, manual push mower and a rake. Now the whole thing gets done in 30 minutes with a direct drive mower with bag attachment. We don’t even need to waste the 5 minutes it takes to make a hard-boiled egg. You can buy them from the grocery store by the half-dozen. And they are already peeled for crying out loud! So what is the deal? The deal is, we have allowed a picture of a suburban American lifestyle and the upward push of economic advancement to compete with the good that God has for us. At worst I have seen this drive for the nicer house, newer car, advancement of the career and social status, literally rip families apart. At best it has people living a life with a veneer of respectability, rushing to soccer games, participating in church events, attending social functions, but underneath, no one is happy. The parents are at odds over money, time, and other priorities, and the kids have a nagging sense of insecurity because there never seems to be any sense of contentment or peace or tranquility. There is a constant striving for something more and an underlying angst that if we get that “something more” we will still be left feeling unsatisfied. Some may think that the problem is in our yearning, our appetite for things. It is because we want so much stuff so strongly that we are left hungering for more of the respectable, comfortable, suburban dream. I was reminded recently that C. S. Lewis maintained that the problem we have is not that our appetites are too strong, but that they are too weak. Our appetites for things like comfort, respectability, social standing, and the like, are actually very small appetites. They are but unfulfilling morsels that have the allure of greatness but the substance of vapor. Yet we are made for much more. We have placed within us a longing and yearning for the eternal, the holy, the majestic. We have a hunger for true meaning and significance. We have been created by God to be His image bearers in the world, to be vice-regents over creation, to reflect the glory of a holy, eternal, all-powerful, gracious, loving God. Our hearts ache to fulfill our created purpose. Stupidly we think we will fulfill that purpose by filling our lives with middle-class morality, respectability, and comfort. There is nothing inherently wrong with running the kids to soccer games, having a nice house in a nice neighborhood, and working at a job that demands much but pays well. What is wrong is when those things become our means to fulfillment, when they become badges of our right relationship with God. We are fooling ourselves when we think so. At that point they are merely idols we worship. And like all idols they over promise and under deliver. And we are still left unfulfilled, frustrated, and yearning for something more. It is only when we take the radical and provocative step of laying down those idols and looking to find our fulfillment in a full on, sold out relationship with Jesus that we find our purpose. Do you want to be in real community with others but have no time? Then dump an idol and replace it with opening your home in hospitality to others. Do you want to make an impact in the life of someone in need? Then forget about your gym membership and spend the time tutoring an inner city child. Do you want to leave a lasting legacy of God’s grace and mercy, then bag your vacation and spend two weeks every summer for the next ten years serving orphans in Haiti or Africa. You see, there is time to fulfill those yearnings God has placed within you. The question is, are you willing to break out of the suburban twilight zone and lay down your idols? Historians love to speculate on the what ifs of major historical events. What if Oswald had missed in November of 1963 in Dealy Plaza? What if Von Stauffenberg had armed both bombs and placed them on the other side of the table leg in Hitler’s Wolf’s Lair? What if Richard the Lionheart had lived to return to England and kept his brother John off the throne? What if attempts on Mohammed’s life in Mecca had succeeded? One can go on for days thinking of such things and it can be an interesting academic exercise. But of all the interesting speculation there is one event that stands out as the most important event in all of history. It is the Resurrection of Jesus of Nazareth, in the early half of the 1st Century, on what we now call Easter Sunday. Now that the latest celebration of Easter is a day in the past, let’s consider the implications of this most historic event. On that Sunday morning, a handful of Jesus followers went to the tomb in which his body had been placed following his crucifixion for blasphemy, claiming to be God, on Friday. They went fully expecting to find his lifeless body wrapped in the sheet it was carried in. Their intent was to finish the proper burial preparations that were left undone as he was hastily buried. What they found instead was an empty tomb and two angelic messengers proclaiming “why do you seek the living among the dead. He is not here. He is risen”. We read about it in among others places, Luke 24 verses 1-7. The subsequent appearances by Jesus to more than 500 people, including the forever nicknamed “Doubting” Thomas, who then fell on his knees and declared of Jesus, “my Lord and my God”, turned what had been seen as a fatal defeat into the most remarkable, stunning, and controversial turn of events in history. There are at least three reasons why the Resurrection of Jesus makes Easter the most important day in all of human history. First there is what The Apostle Paul has to say about it in 1 Corinthians 15, if Jesus had not been raised from the dead then the Christian faith and all we believe about it is a huge waste of time, effort, and devotion. Not only that but we are to be pitied for believing in something that is only of benefit for this life, and in fact makes this life harder to live. Worse yet, it makes us liars about God claiming He did something that clearly He did not. In other words, Paul is saying that without the Resurrection of Jesus there is no such thing as the Christian faith. No one would be following Jesus if He was still dead and in the grave. Those people who went to the tomb that morning had already resigned themselves to the fact of his death. They went not looking for a Risen Savior but looking to honor in death one that they loved. If Jesus had not risen, Peter would have eventually gone back to his fishing nets, Matthew would have reopened his tax office, Mary Magdalene would have slipped into depression and back to her former lifestyle. Saul of Tarsus would have continued his Pharisaic studies and never encountered the Risen Jesus on the Road to Damascus, thus robbing the world of the man who would become known as Paul, and the third most influential person in history behind Jesus and Mohammed. Europe, North Africa, and the Near East never get evangelized. You could even make the case the Mohammed remains a polytheistic herder in Saudi Arabia and Islam never happens. The list goes on so far and deep, it becomes impossible to speculate on how the world evolves if Jesus was never risen. But that is only what the resurrection means for history and world events. There is a second reason why Easter is the most important day in history. If in fact Jesus was risen from the dead, it validates his claim to deity. Historians, scientists, and the average Joe and Jane all agree, zombie movies aside, that people simply do not come back from the dead after being buried in a tomb for three days. The uniqueness of the resurrection points to Jesus as actually being who he claimed to be. Those angelic messengers reminded the women at the tomb that Jesus had spoken of this ahead of time. They and the rest of the followers had either misunderstood or simply shrugged it off as hyperbole. Now they were forced into an understanding of Jesus that was far beyond what they every hoped or imagined. Jesus of Nazareth was also, Lord and Christ, Only Begotten of the Father, King of Kings and Lord of Lords. He was God in the Flesh. Mysteriously Fully God and Fully Man. His subsequent ascension to the Right Hand of the Father has Him seated in Glory from where He will come again. The third and final reason for the resurrection being the most important event in history has nothing to do with the grand sweep of world events. Rather it has everything to do with your life. If in fact Jesus is raised from the dead then what does that change about your future? Will you follow him and put your life on a new course? Or will you simply allow the resurrection to remain this unexamined religious oddity, locking it away in a compartment in your mind, not letting it interfere with life today? Not only does history change completely if the resurrection never happened, but so does your future if you chose to believe it. For twelve years, from 1993 to 2005, Burundi, a nation of 8 million people, suffered through a civil war that took the lives of an estimated 300,000 people. It was a horrendous time of slaughter and genocide. Men, women, children, the elderly, people who had no desire for fighting, were caught in the vortex of tribal hatred. Hutu and Tutsi killed one another with machete and machine gun, just because their tribe was different. During the twelve years of violence, 5% of the population was killed. If that same percentage held true in The United States, that would be somewhere in the neighborhood of 15 million people. That kind of comparison shows with stark reality that everyone in this country lost someone, and some lost everyone. Yet, here I am in the capital city of Bujumbura just six years later and you would never know that anything so horrific had taken place. The streets are full of people going about their daily lives. Shops are open. New homes have been built everywhere you look. A brand new beautiful university sits on the edge of town. Hospitals and schools are popping up all over. There is food in abundance. And smiles and laughter to last a life time. How in the world could such a transformation take place? The answer is simple. One man led the way to reconciliation and renewal by living and preaching the Gospel. That man is Burundian President, Pierre Nkurunziza. I first met President Nkurunziza two years ago in Nairobi, at a summit for African political and church leaders. Yes I know, I am not an African. How and why I was invited is another story altogether. But as events unfolded it was clear that I was supposed to be there and was to find some way to support this president’s vision and mission. At the time of our meeting, he had been in office for four years. Already in that time he brought the warring sides together and called for the church and Christians to demonstrate forgiveness and love for enemies and neighbors alike. He and his wife also led the way by adopting more than a dozen orphans from both Hutu and Tutsi backgrounds and actually holding house church services in their home. He integrated the warring factions into one army that was already being used throughout parts of Africa as peace keeping forces. Just recently he was elected to a second six-year term, a first for this country that had never seen a previous democratically elected leader last more than a year. 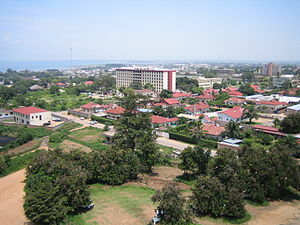 In discussions with some other Christian leaders in Eastern Africa it was eventually decided that the first step in helping advance the vision for a peaceful and growing Burundi, would be to bring Northland’s training on Distributed Church Ministry and Simple Church Planting to the pastors of Burundi. So this week, Pastor Gus Davies and I, along with Northland Elder, Marcus Mennenga, joined with three Kenyan partners, in order to teach 75 pastors how to plant churches, serve the needs of people in their communities, and advance a Gospel of reconciliation in their country. For 12 hours a day for three days, we taught, and taught, and taught. we would break for less than an hour to eat and then get back at it again. And everyday the wife of President Nkurunziza was there as a student, taking notes, praying, and in the end sharing with the entire group how excited she was that these pastors were being equipped in ways that would help continue the transformation of Burundi. The many conversations with these pastors, that took place over meals and at the close of the training, were humbling and inspiring all at once. I was humbled that these men who have been through so much, lost so much, suffered so much, acted as if we had brought them a hope for the future that they never dreamed possible. What inspired me was the commitment they have already demonstrated in living for Jesus, no matter what. Almost every one of them lives by faith. Sometimes there is money in the offering, sometimes not. But as person after person said, “God provides”. They left our training with a renewed energy and tools to reach and serve others. I can’t wait to go back in six months when we do the second level of training with these same pastors and get to hear the stories of changed lives and as a result, a changed country. Hey folks, I need your input. I have been working on the book “The Provocative God: Radical Things God Has Said and Done”. Hopefully it will be available at the end of August. In the meantime I need to pick the cover art for the book. So that is where you come in. I have a few options and decided to make a poll. Check out the covers and then vote on your favorite. You can double click on each individual cover to enlarge it for a better look. Then just click on the poll below to indicate your favorite. Also, it would be great to get your comments/impressions so feel free to write something in the comment section. When the book comes out, one person who left a comment will get a free copy. They will be selected by me in a totally capricious manner, just because I can. Oh and if you don’t like any of them, pick #4. Sorry Rob Bell, But You Are A Theologian. I have had numerous people ask what I think of Rob Bell‘s new book, “Love Wins”. That was before the book was even published. I eventually broke down and bought a copy that I have just started reading. So if you are looking for a complete, provocative response to the controversial book, you will have to check back. But in conjunction with reading the book I came across an article on CNN.com and on which I needed to give a quick take. Leaving aside for now the question of whether his new book is heretical or not, I want to comment on something the article did point out. “He will tell you again and again he is a pastor, not a theologian or a biblical scholar.” I understand what Bell is trying to say, “I am not a trained specialist in theology or biblical studies so cut me some slack”. Sorry Rob but you are a pastor and preacher, by definition you are something of a theologian and must be something of a biblical scholar. Your job as a preacher/pastor is in part to equip people from the truth of God’s Word. Average people view you as a person who understands the Bible and Theology better than they do. They expect a pastor to have a handle on things like, who God is, how you get to heaven, and what eternity will be like. Each week you speak to them and you are doing theology and biblical scholarship. Writing “A Book About Heaven and Hell, And The Fate of Every Person Who Ever Lived”, as your subtitle declares, is shouting loud and clear that this is a book about theology and the Bible. The simple truth is, we are all theologians. We all have ideas about God and do theology. We all have a picture of God. For some the picture is an empty frame because they don’t believe God exists. But they still have a theology. For others it is a smorgasbord made up of various things they have heard along the way and fits their world view. For some there is a small amount of biblical and theological investigation. The difference for you as a pastor is that people actually look to you as someone who should be better at theology and biblical studies than they are. They expect that you devote some significant part of your life learning and studying in order to give them some guidance in truth. I don’t know what I am going to think about “Love Wins”. What I hope I find is that Rob Bell lays out what his time in the Word has led him to believe and what his study of theology has convinced him to be true. I may or may not agree with his conclusions and teaching. But at least we will have a foundation to work from, to dialogue over, that foundation will be the Bible and collective wisdom of the great theologians of the church throughout history.